I've written a program to design rosettes. This is easy with any paint program, but this one adds the calculations for the materials to make the design. Post a reply with an email if you want a copy. Thats a nice idea! But rosettes are round. That could become a problem if you try to build it in real, no? When you build the rosette log that the tiles are cut from, you make it with a taper, so the bottom is wider than the top. This is what allows the tiles to fit together as they go around. The closer you get to the ideal taper, the better. In mosaic rosettes you have some wiggle room as the glue softens everything and to some degree the tiles will conform. In a wooden side grain rosette, like the braid I do, you have 0 wiggle room, either those tiles fit perfectly or they don't. That kind of tolerance is in the 100th of a millimeter. The way to figure out your taper is to take the inner and outer diameter of the rosette channel. Let's say your inner channel measures 95mm across and your outer channel is 107mm across (which gives you a 6 mm wide channel). You mulitple those numbers by pi (3.14) to get the circumfrence (I think that is the correct word) so for inner channel that comes to 298.3. Let's say your rosette tile will be 7 mm wide at the top, so you then divide 298.3 by 7 which is 42.6. That is the number of tiles you will need to completely finish the circle. 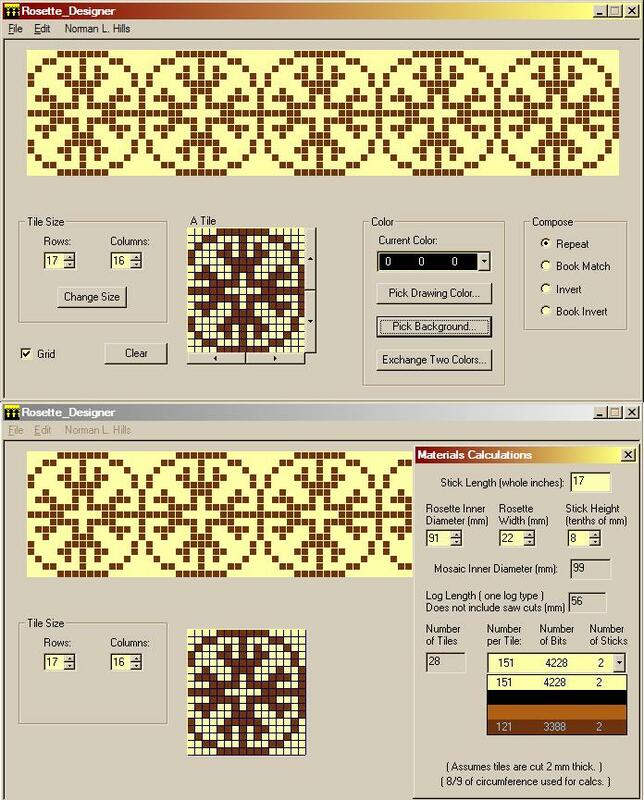 Now you need to figure out the width of the bottom of your rosette tile to come up with the needed taper. Your outer diameter as you recall is 107mm, muliplied by 3.14 gives you 335.98. You know you need 42.6 tiles so you divide 335.98 by 42.6, which is 7.88 which is the width of the bottom of your rosette tile. So now you have a rosette tile that is 7 mm wide at the top and 7.9 mm wide at the bottom and your taper is .9 mm. You would think I actually did good in school, wouldn't you? When making a mosaic rosette you glue up strips of veneers that correspond to one vertical line of your design. Normally I would make them 30 mm wide and 150 mm long, so I can make more than one rosette. You make up as many of these as you need to complete the pattern and then with a very fine saw you cut off a strip that is a bit thicker than you need, using a set scraper you then thickness that strip to exactly the correct thickness (if your veneers were.5 thick then you should make the strip .5 thick) but you make the top a little thinner than the bottom so you are building in the taper as you go along. Once you done with all the stips and you now glue up your log. The maintain your taper you use tapered wooden clamping cauls. This last part can get very tricky but once you got it down, the results can be very good. I realise this is probably more info than anyone wanted but I hope this helps! Does somebody have some photos of a mosaik which is in the buildingprocess? I was allways wondering how they make a mosaik.. Its allwas perfect symmetric with so many small parts. I cant imagine how to make one.. Here's a good photo lesson from David Schramm's website. Aaron that was a great and thorough explanation. Thanks for that! Wow thats interesting! I wanna desighn my own mosaik. That would be cool! Very intersesting! Thank you very much for the link! Is it possible to change a mosaik later with a different one? And how much would it cost? And is it possible to design my own mosaik and give the plan to a guitarbuilder? Very expensive deshou.. Does your program preview the rosette as a circle? Yes - I know about this one. Very buggy, really awkward to use, and everything is too distorted to use if the tile isn't 20x20. Mine doesn't have the circle preview. I might add it some time, but I tried to concentrate on being really useful. The circle preview is mostly glitz. By top and bottom edge of the tile you mean the outside and inside edges of the tile respectively? And by 'inside' I mean the soundhole side. Oh yeah, more questions for you Aaron, I guess it might be covered in the below post, but as I reread your post I found most of the answer to one of my questions. What kind of fine saw are you using? And what is this "set scraper?" Do you have product names model numbers, links or pics? Sorry to attack with so many questions, but once you start explaining things I need to know everything. 1. How thick are the siles sliced? 2. What instrument is used for the cutting of these slices? 3. What type of epoxy is he using for gluing the laminates together? 4. What instrument is used to slice the culumns (I'm guessing the same as that for slicing, but I don't like to assume)? 5. The inner and outer rings in the finished rosette were not mart of the tile he demonstrated making, so where did they come from? Or how are they made? The inside would be that closest to the soundhole. Also the top of the tile would be the side closest to the soundhole. I use a small miterbox and an exacto razor saw to cut the tiles as there is very little waste with the saw kerf. For cutting the strips off the veneer stacks, I use a very thin blade on my bandsaw. In terms of glues, I use hide glue for all mosaic making and inlay. It is far and away the best glue for this job. The set scraper that I use to thickness my strips is a homemade tool so I have no model numbers for you. Basically it holds a thick plane blade on its side with the edge almost up against a thick block of wood. The plane blade is clamped to provide support and you pull the strips between the blade and block to thickness them. You can adjust the thickness by tapping on the plane blade with a hammer. It is a simplier version of an old tool that has been around for centuries. 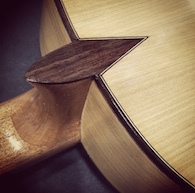 Eugene Clark wrote a two part article on rosette making for the Guild of American Luthiers. In that he has a thickness device that is similar to mine but he uses a blunt nose plane. It seems to work well. You could check out those articles and get another take on rosette making. I am not a huge fan of his process but there is good advice there. Thank you Aaron. Very informative. I shall have to look for those articles to see if anyone has pictures of this plane. Looks like a nice program. It should be in your email, Anders. 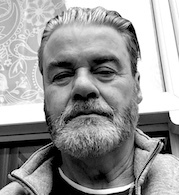 I hope you find it useful - any comments would be appreciated. I have a new version of the rosette program. I have added a "Rings Designer" so you can now design the entire rosette. Plus many fixes and tweaks. Please email me or post a reply to get a copy and give it a try. If you find anything wrong - no matter how small - please let me know! There's a small problem with this app. They should be standard on any Windows machine - they're not part of the development environment. But - I'll send you a version with it incorporated. More accurately, I should say the dll's in the development environment should be redundant. That's the point of release versions and dll's, but sometimes there are version problems. If anyone else who has received the program has the same problem, please let me know - I'll send you the "standalone" version. The first MFC dll it asked me for was "MFC42D.DLL" See how the last letter before the delimiter is a "D"? That means it's calling for the debug version, doesn't it? Yes - but it shouldn't have been. Maybe I screwed up the build. Let's see if anyone else has a problem. The second one worked fine. I was just telling you about the error I got from the first one. Thanks! I have made mosaic rosettes for years in my guitars but always started with pen and paper for the design so I would be happy to try your program. Ring Erik Steen. He´s nice. If you live in the stockholm area. Hi im Henrik from Sweden. This program keeps growing fur, but the latest is probably the final Beta. 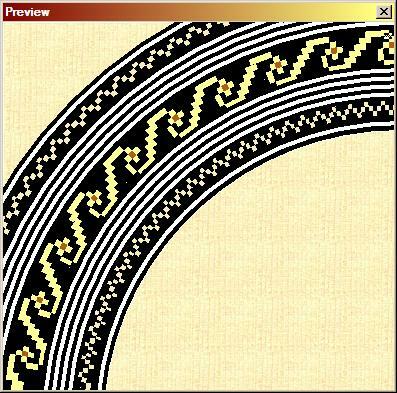 You can now use a secondary mosaic in the border. This let's you do things like this. If you have an earlier version, you'll be receiving this one. It is a Beta - bug reports would be greatly appreciated. Once more - with feeling. Is this musician humour? I am so surprised, I was told they have none.